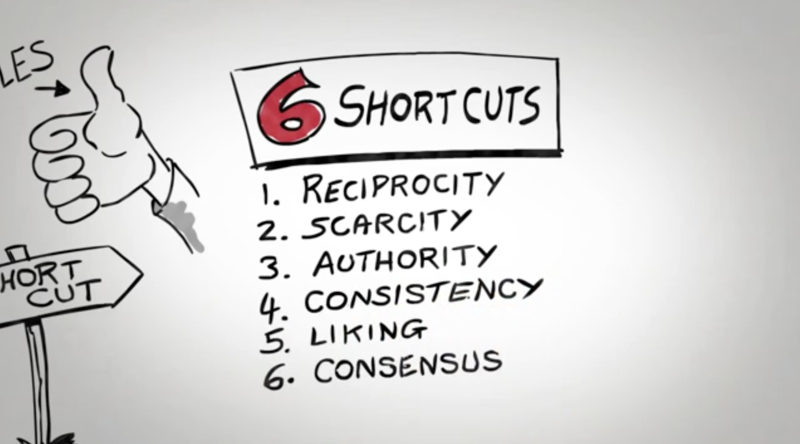 Cialdini identifies the 6 principles of influence and continues throughout the book to explore why and where they occur in daily life, as well as how professionals can exploit them to achieve compliance/their desired outcomes (short video: The Science Behind Sales Persuasion). "Because the rule for reciprocation governs the compromise process, it is possible to use an initial concession as part of a highly effective compliance technique. The technique is a simple one that we can call the rejection-then-retreat technique." (p38). Interestingly the technique is used to explain how the Nixon administration agreed to the undertaking of the Watergate break-in. The tactic applies to the negotiation that occurs during a transaction, wherein you are more likely to achieve a desired outcome if you start by demanding more, conceding, and then settling for less. Employed tactically, the settlement will result in your desired outcome. "For the salesperson, the strategy is to obtain a large purchase by starting with a small one. Almost any small sale will do, because the purpose of that small transaction is not profit. It is commitment." (p71). Whilst not a new phenomena, understanding the reason why this sales tactic is remarkably effective, highlights the power of commitment. A review of POW camps run by the Chinese during the Korean war, showcases how the commitment principle can grow in affect after an initial concession. The idea behind it: Start small, build big. "Not only was it a lasting personal reminder of his action, it was also likely to persuade those around him that the statement reflected his actual beliefs... Once an active commitment is made, then, self-image is squeezed from both sides by consistency pressures." (p77). The reason for the significance of the commitment principle when achieving compliance is that we act in ways that are consistent with our beliefs and perception of oneself. A written declaration, regardless of how trivial, puts pressure on ones' self-image, and can lead to acting in accordance with the initial written statement. Cialdini makes reference to the Amway Corporation who found "something magical about writing things down" in the context of sales reps personally recording their revenue goals on paper. A similar tactic can be used for clients and prospects in getting them to commit to a particular action. It is difficult to renege on written testament. "Our tendency to assume that an action is more correct if others are doing it is exploited in a variety of settings. Bartenders often "salt" their tips jars with a few dollar bills at the beginning of an evening to simulate tips left by prior customers" (p117). We often regard the action of others as the correct form of social behaviour, and in turn act in accordance without thinking too greatly about the situation in hand. Consensus, and the idea of a sheep following the herd, take the thought out of decision-making meaning we can play our internal autopilot. We are much more inclined to act if we see our peers, those we identify with or those we trust having already taken action. Even churches are susceptible to manipulating social proof by preloading collecting baskets with notes and coins and seeding their audience with "ringers" who donate notes rather than coins thereby encouraging generosity in everyone else! "We are phenomenal suckers for flattery." (p175). Joe Girard, cited as the world's "greatest car salesman," employed the simple technique of complimenting his business contacts in order to generate liking. Each month, Joe would send a personalised card to all 13,000 of his clients/prospects with the accompanying message of "I like you". Whilst it is easy to see straight through the flattery and intention, Joe is convinced that his monthly endeavour paid tremendous dividends, and coming from a man that sold 13,001 cars in 15 years, perhaps worth listening to. 6. The trusted advisor - what's your ulterior motive? "Even knowledgeable authorities in a field will not persuade us until we are satisfied that their messages represent the facts faithfully." (p232). Cialdini explains that in any transaction we review a person's trustworthiness to assure us of their sincerity. By wondering how an expert stands to benefit from our compliance, we provide a safety net against automated persuasion. Authentically building profile and establishing domain authority enables an expert to substantiate their credibility. Working in a field where influence is important, authenticity and authority will make it easier to establish trust amongst your contacts. Positioning yourself as a trusted advisor over time, will reduce the concern of your contacts when it comes to questioning your motivations. Influence Your Attendees with Cialdini’s Principles of Persuasion https://t.co/ZM4cWx3D2I great read, books are a must!